Totally Charming! 1018- 11.77 10. including our stunning collection of Silk Blouses! Whimsically Chic! Consider carefully before purchasing as Sale is Final. It has a sort of light almost waxy feel, almost like it was a batik piece. It could be used as table cover or worn, even with the flaws. Excellent-Perfect with barely any wear, and any flaws will be noted. Size : approx: 26" Square. Fabric : Rayon. Size : approx: 27" Square. Rolled edges. Size : approx: 26" Square. Fabric : Rayon. Machine turned edges. Size : approx: 30" Square. DATE~ Orignal 1950s. ITEM~ Scarf. FABRIC ~ Silky rayon. COLOUR ~ Brown with a floral print. We have a passion for tailoring, prints and individuality. 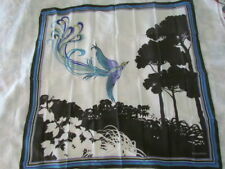 (1) This is a rare silk scarf from 40's or earlier, label has made in great Britain by jacqmar, London England 100% silk. Very rare can find nothing like this. 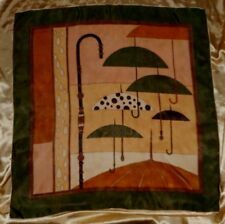 Hand rolled silk, has small mark (see photos), does not distract from this lovely item. I have laundered the fabric every 7 or 8 years, as it’s been in my collection. The last laundering was in 2009. This item looks stunning, adding a vibrant and individuality to any coat, dress or jacket. 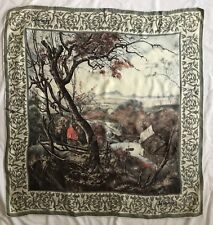 Fabulous and rare vintage silk Jacqmar scarf. ’Pietro Annigorni - Autunno Printed in Italy The sheen is mesmerising, as the silk is very iridescent. This one was given to me in 1972 and according to records it’s from the 1950s. It’s remained unworn. 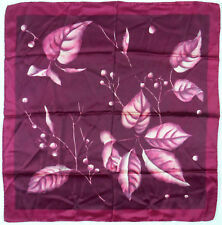 The silk is without any distress, age marks or shattering. The edges are hand rolled and stitched and are in excellent condition. The approx measurements; 35” x 36” This item looks stunning, adding a vibrant and individuality to any coat, dress or jacket. Please drop me a line should you have any questions Opening hours; Monday - Friday 09.00 to 16.00hrs Saturday 10.00 to 12.30hrs Closed - Sunday and all Bank Holidays.